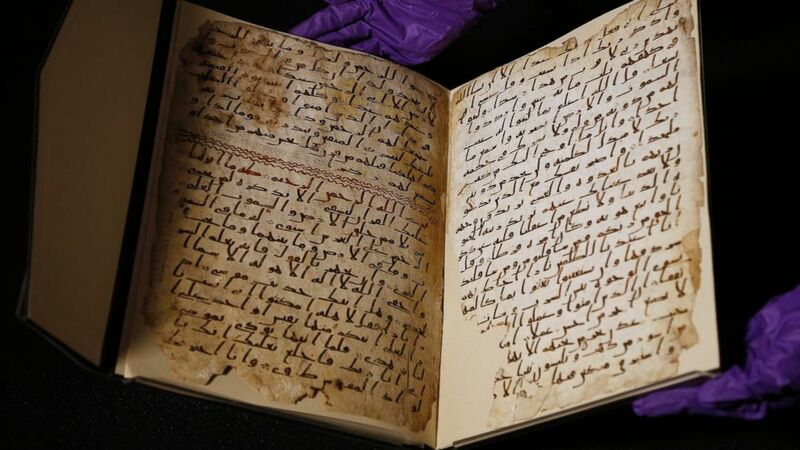 Experts at the University of Birmingham believe they have discovered a manuscript of the Qur’an that is at least 1370 years old, making it perhaps the oldest known copy of the Islamic Holy Book. Radiocarbon analysis has dated the parchment on which the text is written to the period between AD 568 and 645 with 95.4% accuracy. The test was carried out in a laboratory at the University of Oxford. The result places the leaves close to the time of the Prophet Muhammad, who is generally thought to have lived between AD 570 and 632. Researchers conclude that the Qur’an manuscript is among the earliest written textual evidence of the Islamic holy book known to survive. This gives the Qur’an manuscript in Birmingham global significance to Muslim heritage and the study of Islam. The Qur’an manuscript is part of the University’s Mingana Collection of Middle Eastern manuscripts, held in the Cadbury Research Library. Funded by Quaker philanthropist Edward Cadbury, the collection was acquired to raise the status of Birmingham as an intellectual centre for religious studies and attract prominent theological scholars. Consisting of two parchment leaves, the Qur’an manuscript contains parts of Suras (chapters) 18 to 20, written with ink in an early form of Arabic script known as Hijazi. For many years, the manuscript had been misbound with leaves of a similar Qur’an manuscript, which is datable to the late seventh century. Explaining the context and significance of the discovery, Professor David Thomas, Professor of Christianity and Islam and Nadir Dinshaw Professor of Interreligious Relations at the University of Birmingham, said, “The radiocarbon dating of the Birmingham Qur’an folios has yielded a startling result and reveals one of the most surprising secrets of the University’s collections. They could well take us back to within a few years of the actual founding of Islam. “According to Muslim tradition, the Prophet Muhammad received the revelations that form the Qur’an, the scripture of Islam, between the years AD 610 and 632, the year of his death. At this time, the divine message was not compiled into the book form in which it appears today. Instead, the revelations were preserved in “the memories of men”. Parts of it had also been written down on parchment, stone, palm leaves and the shoulder blades of camels. Caliph Abu Bakr, the first leader of the Muslim community after Muhammad, ordered the collection of all Qur’anic material in the form of a book. The final, authoritative written form was completed and fixed under the direction of the third leader, Caliph Uthman, in about AD 650. “Muslims believe that the Qur’an they read today is the same text that was standardised under Uthman and regard it as the exact record of the revelations that were delivered to Muhammad. Dr Muhammad Isa Waley, Lead Curator for Persian and Turkish Manuscripts at the British Library, added, “This is indeed an exciting discovery. We know now that these two folios, in a beautiful and surprisingly legible Hijazi hand, almost certainly date from the time of the first three Caliphs. According to the classic accounts, it was under the third Caliph, Uthman ibn Affan, that the Qur’anic text was compiled and edited in the order of Suras familiar today, chiefly on the basis of the text as compiled by Zayd ibn Thabit under the first Caliph, Abu Bakr. Copies of the definitive edition were then distributed to the main cities under Muslim rule. The Qur’an manuscript will be on public display at the Barber Institute of Fine Arts, University of Birmingham, from Friday 2 October until Sunday 25 October.